Strategic Innovation Alignment or Constant Frustration? I would argue most problems or disappointment within our innovation efforts can be attributed to a lack of alignment to the organizations strategy and/or its poor governance with the end results that undermine all the ‘noble’ efforts put into the process of innovation. Poor strategic alignment can be overcome by working through a comprehensive approach to addressing all areas that impact innovation. One such framework I believe can help, as explained here, through the work mat approach. 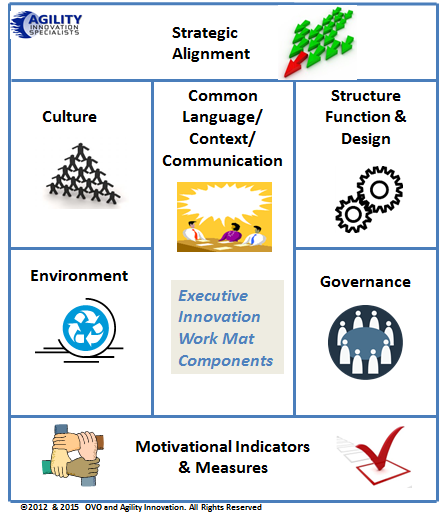 I believe this work mat approach does moderate and organize innovation for greater alignment. It allows for the senior management to become engaged and shape the direction as it takes a more holistic approach. The work mat contains governance as specifically part of its framing as this can do far more in driving the conditions to innovate. The intent with developing this work mat approach has been to clearly set out that much-needed ‘greater’ strategic connection through engagement at a senior level, they drive the outcomes, they provide understanding beyond the vision to make the necessary connections, they fuel the engine and ignite the energy that innovation needs. The work mat seeks out separate conversations on the different domain areas shown above and then combines them. Senior leadership should be articulating what they expect and want from each of the critical parts and then communicate these throughout the organization. The end result of this thinking through provides for a greater ‘common language’, setting innovation in context. Structuring this well can achieve much towards reducing the multiple interpretations, and the variety of initiatives often described or justified as innovative but definitely missing the strategic mark. Alignment of an organizations strategy and innovation approach is essential and this needs to flow from the top, but I feel there has not been a suitable engagement platform to gather around and work through, the work mat is aimed at filling that gap. A majority of people within the organization seem to struggle to connect innovation with their own place and contribution and this often both ‘contains and constrains’ innovation, they lack a mindset for it. This reinforces innovation as staying locked within its own silo of dedicated people, broader identification can break down. Far too much time is spent in communication and breaking down barriers and pockets of resistance. We lack broader alignment as well as strategic innovation alignment. Both need resolving. We need to understand the innovation journey. This framework mechanism becomes the innovation strategic foundation document that articulates innovation and provides the guiding aspects of innovation for others to work through. Designing a new strategic innovation framework at the top of organizations can help close the many gaps we see today in innovation, especially in the need to achieve a growing alignment to an organizations strategy. You are embedding innovation into the organization core. In a series of previous articles you can explore the thinking and make up of this work mat approach. I would encourage you to explore these, if you want to delve a little deeper. These covers the strategic innovation framework to set the context of the work mat approach for planning the innovation direction. I have also suggested using the innovation conversation framework discussed in a recent post for deepening your innovation dialogues. Also covered are the principles to cascade effect for better choices throughout the organization for a greater identification and relationship. Often we don’t give the necessary thinking time for aligning innovation across the organization, we fail to develop the innovation and strategic alignment conversations the way we should, we are sometimes far too impatient to simply get on with innovation. 2. Offer the critical parts of this framework and the ‘essential bones’ that ‘direct and inform’ for the innovation activities. 3. Suggest this growing recognition that all the component parts making up innovation do need this clear articulating. – A framework that raises the visibility of innovation as well as reduces risk and misalignment. – The use of frames becomes the organizing point for alignment of activities, measurement, compensation and recognition from its inspiration, clarity and connecting and becomes a real sustaining source of impact. Covering innovation in a comprehensive and strategic aligned and connected manner does take away much of the guesswork, disconnects and often the poor leadership buy-in for investments needed to support innovation. Giving our leadership the ownership of the Work Mat does establish innovation far more into the core of organizational design, something that is often missing. I believe this can be well resolved by adopting this Executive Innovation Work Mat framework as a well thought-through approach. Designing innovation needs to have this ‘connected’ understanding and some specialized external facilitation would greatly help the senior leadership to work through this, to help them connect many of the ‘dots’ they have limited opportunity to complete themselves, without their significant investment in time and efforts. I am happy to discuss this further as I believe this has real value within your innovation needs.